→ To get access to the Roadmap, the permission ROADMAP_DISPLAY_PERMISSION is required. A Confidential Initiative/Release is only displayed for the BizDock Users who are either Manager, Portfolio Manager or Stakeholder (direct or from a Portfolio) of this entry. Idem for a Concept Initiative/Release: only BizDock Users that are either Manager, Portfolio Manager or Stakeholder (direct or from a Portfolio) of this entry can see it. 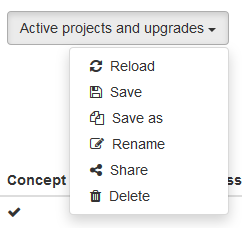 By default, only the active Initiatives/Releases are displayed, this can be simply modified by changing the filters. 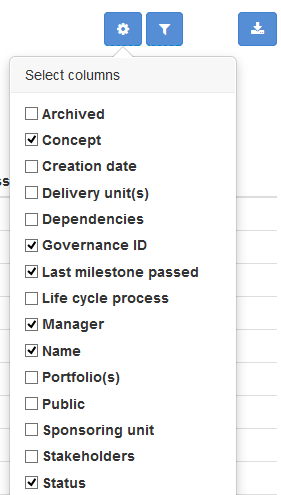 The checkboxes (first column) and the actions selector are displayed only if the user has the permission ROADMAP_SIMULATOR_PERMISSION. This feature is detailed in the Capacity simulator section. The “Status” column has a particular comportment: first when the mouse overs it then an infobulle is displayed with the report comment, and by clicking on it then the corresponding report is displayed. Each BizDock User can personalize his Roadmap view. He can select filters to restrict the list of entries (each filter can be selected once) and choose which columns are visible (including the configured Custom Attributes). Again, the Initiatives/Releases list is based on the BizDock User's Permissions. The Roadmap includes the KPI related to the Initiatives/Releases. It's possible to filter on them, and to show or hide their column. 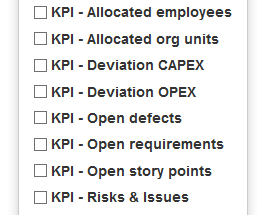 Not all KPI are filterable. The rule is explained in the administrator's guide. By simply clicking on the button, an Excel export of the Roadmap table will be made available in the BizDock User's Personal space. The capacity simulator actions are available for users with the permission ROADMAP_SIMULATOR_PERMISSION. To trigger a simulator action, simply check the wished Initiatives/Releases and select an action in the “Actions” selector. The boxes are dynamically displayed on the top of the page just after the trigger of the action. The financial boxes (budget and forecast) are displayed only if the user has the permission PORTFOLIO_ENTRY_VIEW_FINANCIAL_INFO_ALL_PERMISSION. 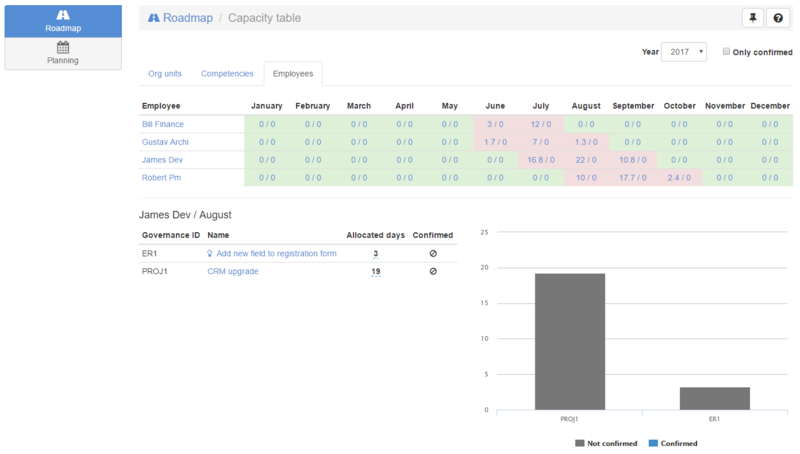 The capacity table is a powerful table with a month-distributed overview of the allocations. On the top of the page, it is possible to configure the selected year and to filter the allocations with only the confirmed ones. The table reloads automatically when changing any value. Under the configuration area, a 3-tabs selector is shown. The first tab represents the allocations grouped by “Org units”, the second one by “Competencies” and the third one by “Employees”. Finally, the details of an allocation summary (Org units, Competencies or Employees) can be displayed just under the table by clicking on a cell. A row represents an Org Unit concerned by at least one of the checked Initiatives/Releases, meaning either the Org Unit or an Employee of the Org Unit is allocated to the entry. Planned: sum of Org unit allocations for the checked Initiatives/Releases, plus sum of Org Unit's Employees allocations for the checked Initiatives/Releases, plus sum of Org Unit's Employees allocations for all activities. Available: sum of capacities of the Org Unit's Employees. The Employees allocations for the activities and the “available” value do not change regardless of the checked entries. Only the allocations with a start and an end date are taken in account. Given an allocation of 10 days for the period from the 21/04/2015 to the 20/05/2015 (that is 30 days). The period contains exactly 10 days for April and 20 days for May. The tolerance is a percent value defined in the System preferences. The default value is 10%. A row represents a Competency concerned by at least one of the checked Initiatives/Releases, meaning either the Competency or an “Employee with the Competency as the principal one” is allocated to the Initiatives/Releases. Planned: sum of Competency allocations for the checked Initiatives/Releases, plus sum of “Employees with the Competency as the principal one” allocations for the checked Initiatives/Releases, plus sum of “Employees with the Competency as the principal one” allocations for all activities. Available: sum of capacities of the “Employees with the Competency as the principal one”. The other principles described in the “Org Units table” sections are also relevant here. A row represents an Employee concerned by at least one of the checked Initiative, meaning that Employee is allocated for at least one day on the given Initiative. The “cell details” is displayed under the Org Units/Competencies table after having clicked on a cell content. Table: the table (on the left) contains for the first row the data related to the corresponding Org Unit/Competency and for the other rows the data related to the Employees of the corresponding Org Unit/Competency. Chart: the bar chart (on the right) is a visual representation for the Employees rows. The “cell details” is displayed under the Employees table after having clicked on a cell content. Table: the table (on the left) contains for the first row the data related to the corresponding Employee and for the other rows the data related to the Initiatives allocated to the Employee. The number of days allocated to the Initiative can be directly updated by clicking the corresponding number. Once the new number of days has been validated, the table is automatically reloaded. Chart: the bar chart (on the right) is a visual representation for the Initiative rows. The Roadmap can also be visualized as a Gantt chart. Each phase can be configured on demand, the start and end dates represent a Milestone. The color of the phase is the one of the latest Status Report. It's easy to get some information about the Initiative/Release by simply clicking on the phase bar.